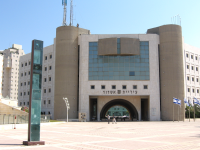 Located on the Mediterranean coast, Ashdod was built in 1957 it was incorporated as a city in 1968. The first modern Israeli settlement in Ashdod was made in 1955, and in 1965 the deep water port was completed. Being a planned city, expansion followed a main development plan, which facilitated traffic and prevented air pollution in the residential areas, despite population growth. It is centered around Israel’s largest and newest port which was originally planned chiefly for the export of citrus fruit. Today it is a busy, thriving town with dock facilities and an electric power station. The Port of Ashdod is situated about 40 kilometers south of Tel Aviv, adjoining the mouth of the Lakhish stream. 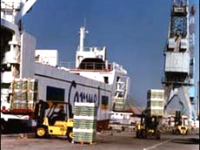 It is Israel’s leading port after Haifa, accounting for about 60% of the country’s imported goods. Construction is Ashdod’s main industry and its manufactures include synthetic fibers, woollen yarn, and knitted goods. 62% of Israel’s freight passes through the port of Ashdod. 160,000 tourists travel through the port on about 180 ships every year. Ashdod is one of Israel’s three major ports on the Mediterranean Sea. 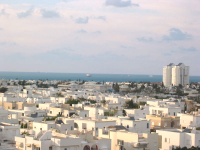 Ashdod had a population of 206,400 at the end of 2009, the sixth largest city in Israel. Upon Joshua’s conquest of the Promised Land, Ashdod was alloted to the Tribe of Judah (Book of Joshua 15:46).